Last week saw the U.S. dollar gain strength against other major currencies, with the dollar up about 1.8% against the Euro, up 1.9% against the British pound and up 3.3% against the Japanese Yen. On a year to date basis the dollar is basically flat against the Euro, up about 5% against the British Pound and up about 11% against the Yen. Overall, last week was the best week for the dollar in the past three years. The largest driver behind currency movements this past week was the Federal Reserve. Perhaps unsurprisingly, the market rewarded the Federal Reserve’s inkling that inflation and the end of quantitative easing are on the table with a strengthening dollar. The strengthening dollar coincided with poorly performing equities and increasing yields on interest bearing assets, with the 10 year up about 40 basis points on Friday. In looking forward to the coming week, a number of influential indicators are on the docket, each of which could move exchange rates by large amounts. The upcoming indicators include new home sales from the U.S. (better than expected would likely provide support to a stronger dollar); durable goods orders in the U.S (again, higher than expected could provide support to dollar appreciation, whereas weakness compared to the European Union could have the opposite effect); U.S., Eurozone, Germany, and France business and consumer confidence; GDP growth rates for the U.S., France, Germany, and the United Kingdom; and a number of influential macroeconomic indicators from Japan and South Korea. The GDP figures will likely be the largest mover. On outlook, the Euro has a small upward bias against the dollar for the coming week, with an expected range for the coming week of 1.29 to 1.34 dollars per Euro (about a 0.25% upward bias to the Euro). Other exchange rate outlooks for the coming week are: a range for the USD/GBP of 1.51 to 1.58 (about 0.5% upward bias to the pound); and an even range for the dollar/yen of 96 to 100. 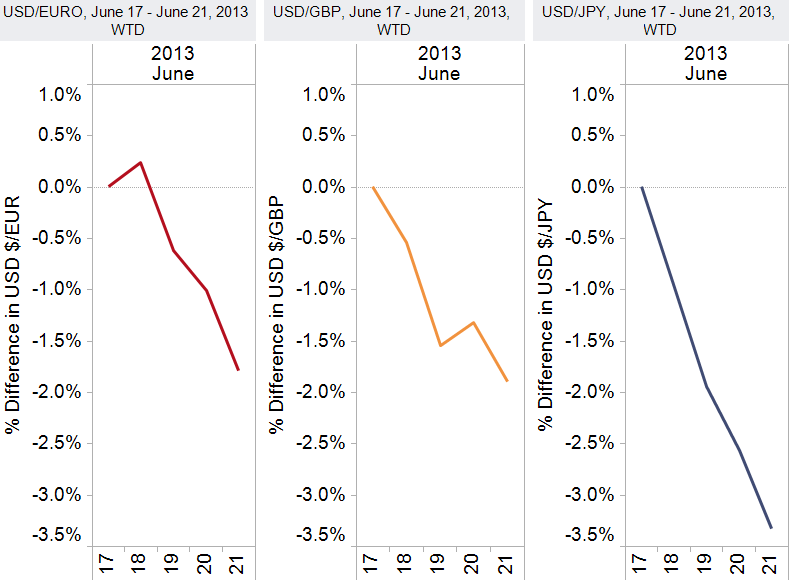 The dollar strengthened last week and is generally stronger against most major currencies so far this year. Analysts generally have a larger-than-usual range for the dollar outlook, with a range of 1.29 to 1.34 USD/EUR (0.25% Euro upward bias); a range for the USD/JPY of 96 to 100 (even); and a range for the USD/GPB of 1.51 to 1.58 (0.5% GPB upward bias). With some very influential European economic data on tap in the coming week, the Euro has heightened risk of depreciation should data come in too far below expectations, whereas any indications of strength could come at the expense of dollar owners. 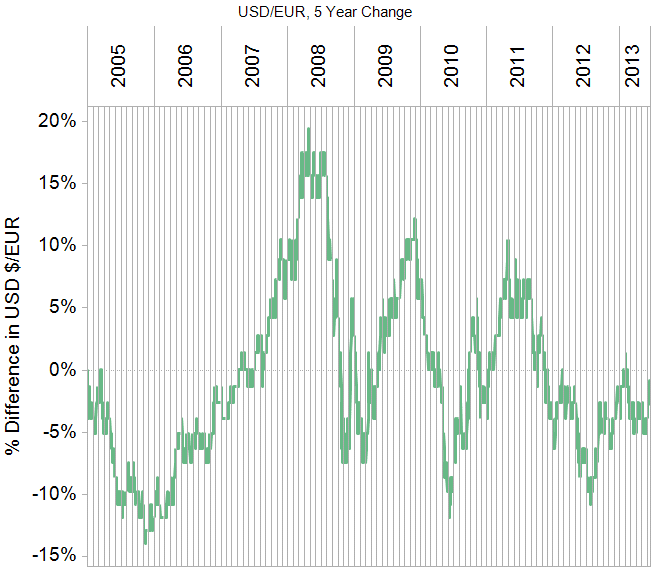 On a five-year basis, the Euro is only down about 5%, indicating that other factors beyond economic growth are influencing the relative strength in the Euro. The expected range for the coming week is 1.29 to 1.34 USD/EUR (a slight 0.5% upward bias towards the Euro). With U.K. credit conditions and final UK GDP figures likely to play second fiddle to the U.S. and European data in the coming week, movement towards or against the pound is likely to be external, with the exception of whether the UK Financial Stability Report will have any affect. 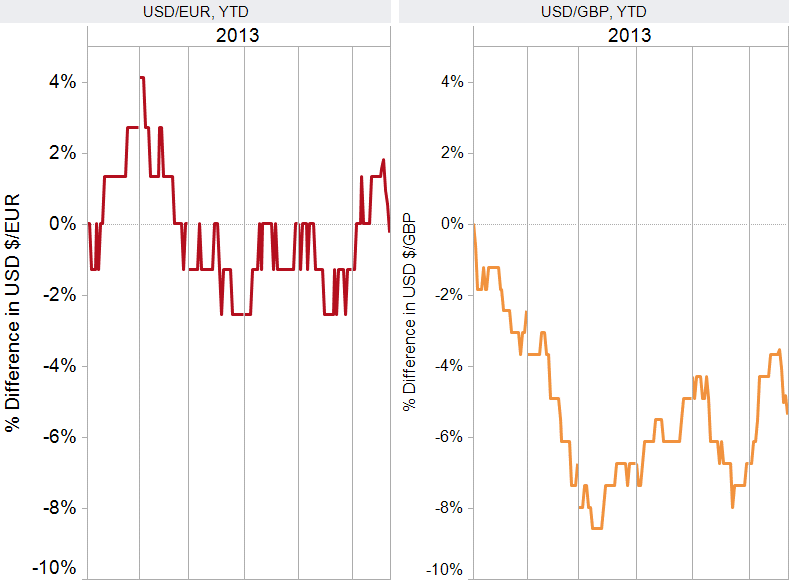 On outlook, analysts have a slight 0.5% upward bias to the Pound for the coming week, with a low at 1.51 and a high at 1.58 USD/GBP. Based upon the historical role the Yen has played as a safe currency, one would have expected the Yen to have been strong this past week given the lackluster economic data. Surprisingly, the Yen weakened against most of its major trading partners, largely because of concern over how safe the Yen is now. With that said, the anticipated range for the coming week is 96 to 100 USD/JPY, representing an even spread. Should economic data coming in poor on a worldwide basis, the Yen will likely gain strength, whereas better than expected data will likely push the Yen lower. Headquartered in Switzerland, the CC Holdings Group provides clients with financial services including physical bullion, deliverable foreign exchange, custody and payment services.